Ben and Candy Carson's home birth story is insane. 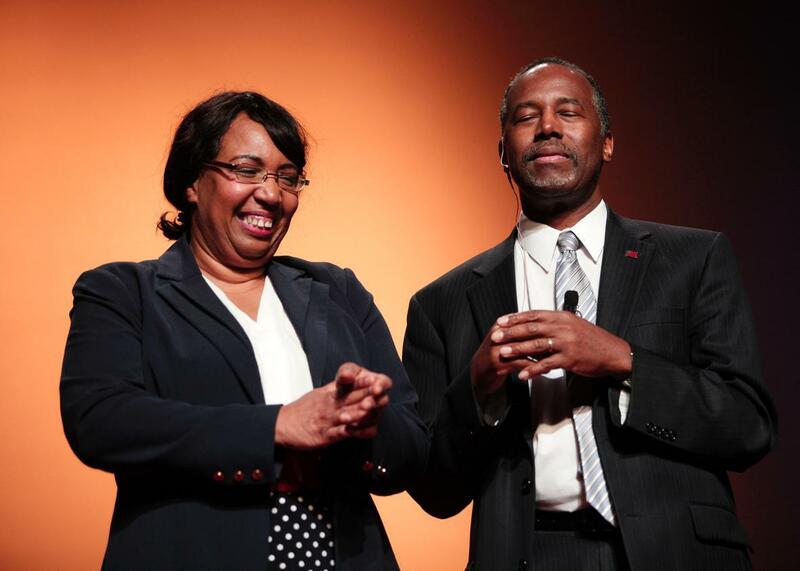 Ben Carson and his wife, Candy, at the Music Hall Center for the Performing Arts on May 4, 2015, in Detroit. I ran up and down stairs looking for anything that might work, peering into drawers, checking on shelves, using my imagination to conjure up an answer to the problem as I searched the entire house, along with Ben’s mother, who was staying with us to help. Ben was calling out potential solutions, suggesting clothespins and other items. Ben eventually fashions a cord clamp out of an old roller pin, proving yet again that he is a reproductive health expert. If the Carsons didn’t have a penchant for tall tales, they might have pulled this one over on me. Sure, home births happen all the time in the United States, and yes, people who aren’t obstetricians can definitely catch a baby in an emergency—although, let’s be honest, you want a trained professional protecting that perineum. But—really? I’ve delivered hundreds and hundreds of babies, so let me offer my two cents. For starters, home births are not for everyone. The American College of Obstetricians and Gynecologists (ACOG) explicitly states that planned home birth should be attempted only in a select population of women who have been prescreened by a physician for appropriateness. According to a new study, the risk of neonatal death is 2.4 times more likely with home births as compared to hospital deliveries. Meanwhile, Carson’s neurosurgical training doesn’t equip him to know the first thing about home birth. Why did the placenta apparently come out at the exact same time as the baby? I have no idea! Usually the mother delivers the placenta—which looks and feels like a giant uncooked steak—sometime after the baby’s birth. Almost simultaneous delivery could be a sign of a placental abruption, in which case you’ve got yourself a true obstetrical emergency. You should probably drop everything and call 911, not go on a treasure hunt for a makeshift clamping device. Or at least you should send your husband to do this, because chances are you’re hemorrhaging and probably shouldn’t be running errands up and down the damn stairs. What’s going on with the baby while Candy is running around the house? Hopefully the baby is being warmed, dried, and stimulated, as is the standard of care with a routine delivery. Hopefully the baby is pinking up. You know what helps with this? Skin-to-skin contact. Hopefully Ben took his shirt off! Can you cut an umbilical cord with a hair pin? I mean, anything is possible. I once had a patient who wanted me to cut her umbilical cord with a razor blade over a flame and a block of obsidian. (I didn’t do it.) In theory, you can clamp the cord with a variety of objects, including shoelaces, pieces of string, or lace. What happens if you don’t clamp the umbilical cord? Ah, the good ol’ Lotus birth, or umbilical nonseverence. The theory here is that so long as the placenta is still attached to the baby, nutrients are flowing and the baby is benefiting. Here’s what’s really happening: Several minutes after birth, the blood vessels in the umbilical cord clamp down naturally, halting the flow of blood both to and away from the baby. At that point, there is no clear medical benefit to keeping the placenta attached. It’s also well established that delayed cord clamping in an inappropriate candidate can lead to hemorrhage and neonatal anemia. So there you have it. Maybe the birth went exactly the way Candy describes it. If it’s true, we just hope that Dr. Carson doesn’t make his neurosurgical patients fetch their own surgical tools. And we hope the Carsons hired a really good house cleaner after this blessed event.